With the first series being such a massive success, it would have been pretty dull not to commission a second series of the childish comedy, This Is Jinsy, written and performed by Chris Bran and Justin Chubb, who take us on a wacky adventure set around the island of Jinsy, which leads to disastrous results. From a killer wig to killing off an old resident due to the population ever-increasing you are a guaranteed to laugh your socks off. The director, Matt Lipsey (Little Britain, Psychoville), who is good friends with the writers, has returned to direct the second series. In November I attended the press screening of the new series where I got to see in advance the first two episodes and was also attended by the creators and stars of the series. This wonderful, yet strange part sitcom / part sketch show focuses on the insane world set of the island of Jinsy, which is run by Arbiter Maven (Justin Chubb) alongside his trusty team which includes Sporall (Chris Bran), Soosan Noop (Alice Lowe) and Trince (Geoff McGivern). The first episode shows Arbiter Maven desperation of growing his hair back so he can get rid of his awful looking wig once and for all. 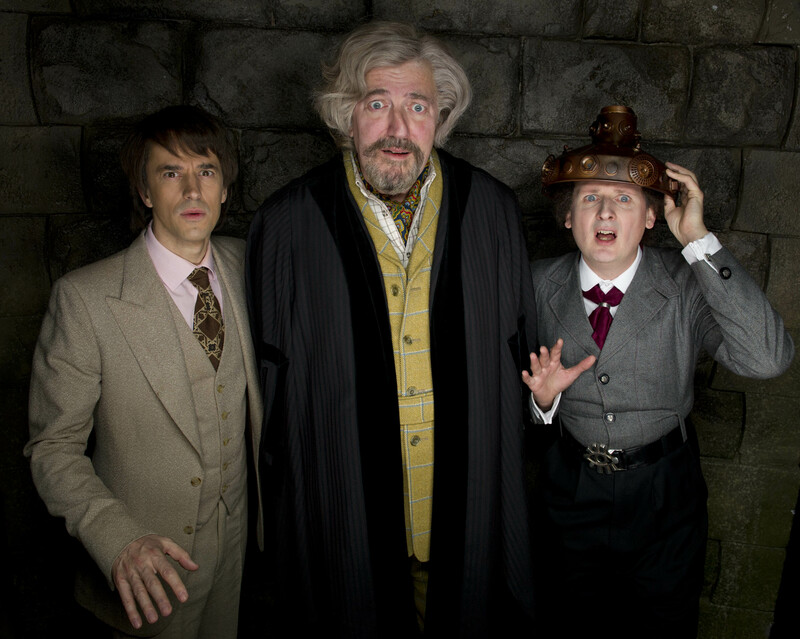 But of course, nothing goes down nicely as the four of them, alongside with guest star Stephen Fry gets trapped and must find a way out to beat the evil wig. Episode Two shows a more dark comic side of the programme which involves the characters needing to kill off the oldest resident of Jinsy in order to balance the population. The oldest resident is of course played by legendary actor, Derek Jacobi. However, we find out a shocking connection between the old man and Arbiter Maven. In both episodes, they include mini-sketches which stars Greg Davis (Inbetweeners) as someone who is dressed in women’s clothing and selling random silly stuff. This is Jinsy also has an old member of the show – the amazing Jennifer Saunders as Miss Reason! Other shows of the series which will be shown in the future will include Rob Brydon, Ben Miller, and Olivia Colman. For a comedy programme to get a second series, of course this is going to be big for the cast and crew of the show. The first series was nominated for the best sketch show category at the British Comedy Awards in 2011. The first series included brilliant guests such as Catherine Tate, David Tennant and Harry Hill. Justin and Chris both revealed that the biggest inspiration in their lives and for the series were the likes of Monty Python and The League of Gentlemen. When asked where Jinsy was based, they both laughed and commented “In between England and France.” They have admitted that if they did get the thumbs up for a third series then they are prepared with scripts and other details because they have ideas for it already. This is Jinsy is the silliest thing that has ever been on British television. However, you can’t help to love it. The one-liners, the sketches, and the storylines are so brilliantly bad, they are good in its own little way. Although, as it’s really good, I think personally this should be the last series of the show due to people getting bored very quickly. Sitcoms these days are very tough due to other people’s ideas and slots – the public always wants to watch something new; a taste of new blood. This is Jinsy will go down in history as one of the greatest, but… they need to stop sooner rather than later. If the audiences gets bored with it then they will lose interest very fast indeed.